LANSING, Mich. — Sen. Dale Zorn on Wednesday introduced legislation designed to combat opioid prescription fraud by requiring prescriptions for the drugs to be transmitted from the doctor to the pharmacy electronically. “We must end the illegal supply of these highly addictive drugs if we ever hope to stop the state’s growing opioid abuse problem,” said Zorn, R-Ida. “Prescription fraud can happen with altered pill counts, forged signatures and completely stolen prescription pads. Senate Bill 802 would require prescriptions for controlled substances containing opioids or benzodiazepines be electronically transmitted to a pharmacy by Jan. 1, 2020. To ensure the new requirement is not an unreasonable burden on prescribers, the bill would give the Michigan Department of Health and Human Services the ability to grant a waiver if internet access is an issue. 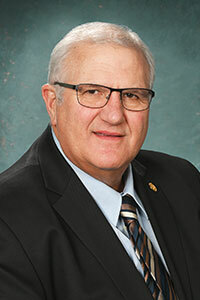 LANSING, Mich. — Sen. Dale Zorn will be available for comments following the governor’s 2018 State of the State address on Tuesday. Immediately following the address, which is scheduled to begin at 7 p.m. on Tuesday, Jan. 23. LANSING, Mich. — Sen. Dale Zorn on Wednesday voted for several tax relief measures, including legislation to preserve the personal exemption on the state income tax and provide additional tax relief for Michigan families. The federal Tax Cuts and Jobs Act signed in December streamlines the exemption process and effectively ends the federal personal exemption. Since the state personal exemption is based on the federal return, without a revision to state law, Michigan taxpayers would no longer be able to claim personal exemptions on their state taxes. Senate Bill 748 makes necessary changes to maintain the state personal exemption and also boost the exemption by an additional $700 to $5,000 by 2021. The state personal exemption is currently scheduled to increase from $4,000 to $4,300 over the next three years. 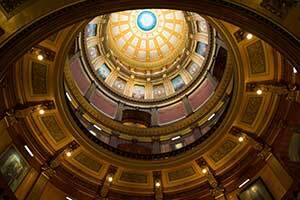 Without SB 748, Michigan taxpayers could face a state income tax hike of nearly $1.5 billion. “Maintaining a high level of funding for our schools is an important part of this legislation as we continue to strengthen the education of our children, who are the next generation of Michigan workers,” Zorn said. Zorn also voted on Wednesday to override the governor’s veto of SBs 94 and 95, which would speed up the state’s “sales tax on the difference” reform. Under the bills, the reform to limit Michigan sales and use taxes to only being applied to the difference between the price of a car and the value of a trade-in would be fully implemented in 2028 instead of 2039. 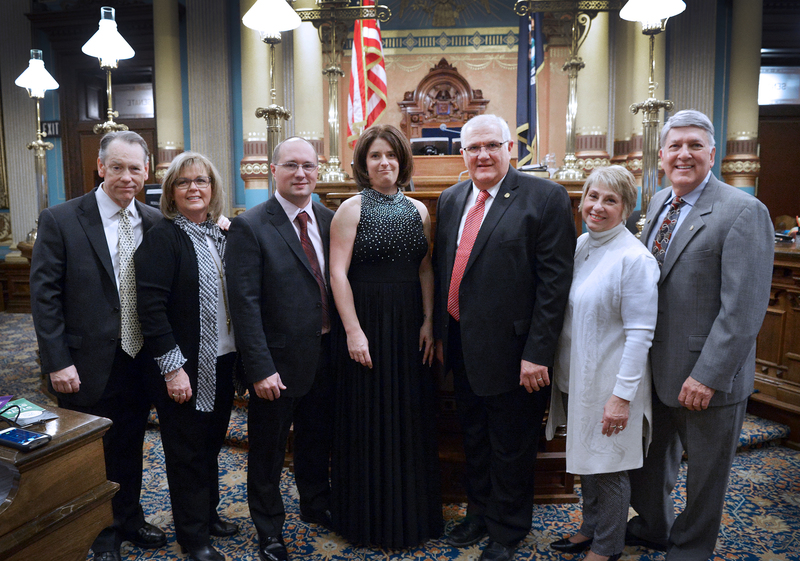 LANSING, Mich. — Sen. Dale Zorn has co-sponsored new legislation to preserve the personal exemption on the state income tax and provide additional tax relief for Michigan families. Senate Bill 748 makes necessary changes to maintain the state personal exemption and also boost the exemption by an additional $500 to $4,800 by 2021. The state personal exemption is currently scheduled to increase from $4,000 to $4,300 over the next three years. “I co-sponsored this critical reform to stop an unintended and unnecessary tax hike on state taxpayers and to provide an additional tax break for Michigan families,” Zorn said. The bill has been referred to the Senate Finance Committee, which is expected to hold a public hearing on the measure on Tuesday. LANSING, Mich. — Sen. Dale Zorn, R-Ida, welcomed the Rev. 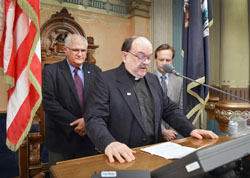 Gerard Cupple to the Michigan Capitol on Thursday. 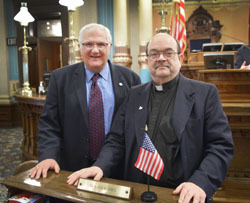 Cupple serves as pastor at the St. Gabriel Catholic Parish in Ida and Dundee and delivered the invocation before Senate session. Lt. Gov. Brian Calley joined Zorn and Cupple for the invocation.